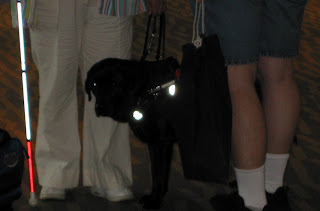 In lieu of posting a picture of Boogie this week, I'm going to post a photo of this very pretty service dog who attending Denvention with her human. She's a good, good girl, and service dogs are the BOMB. My Mom has been training service dogs, they are the bomb indeed. I love the way the canes light up with flash photography. We have a picture of Logan with my father-in-law's cane and it looks like he's riding a lightsaber.